Converts take a dip in the pond. The Christian padre hymns. People around cheer, wave flags, and welcome new devotees, as Kashmiri Muslims take a tryst for Christianity. It was a religious spectacle. A YouTube video was enough to spread discontent amongst the religious elites advocating majority Islam, considering the volatility of societal objections that has increased so much since the last four years in Kashmir. The padre prayed for the spiritual rebirth of his new devotees, mocking the old Adam in them, and praying for the elevation of new Adam under Christianity. If it wasn’t a provocation, then what was it? Even if these conversions were from free will, the purpose of marketing Christianity in Kashmir, in contempt, killed the ethical motives behind it. Yes, Islam says that there is no compulsion in religion, but that shouldn’t be taken as tool to disdain it, just for the sake of attaining unholy moral leverages. Kashmir is not a pluralistic vale anymore. There are fundamentalist religious factions, opportunistic political factions and devouring cynics, waiting to mock our socio-cultural environs. These are the occurrences which actually altercate into chaos and carnage. In times like these, an attribute of responsibility amongst the so called care takers of faith, serves as a saving from social bedlams. While going through news portals about Kashmir, I wasn’t quite skeptical about the rise of religious conversions in Kashmir. These instances have happened in the past. And if there are forces at work, which under the guise of economic and social upliftment, demand people to change their faith, it only allows exploitation of people, a means to play with their misfortunes and nothing else. It also makes these newly converts to stay as quite Christians, thereby allowing even more fractures in a collective Kashmiri society. 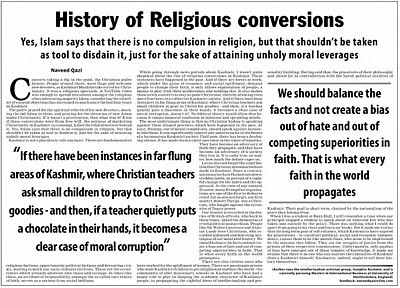 And if there have been instances in far flung areas of Kashmir, where Christian teachers ask small children to pray to Christ for goodies - and then, if a teacher quietly puts a chocolate in their hands, it becomes a clear case of moral corruption, doesn’t it? No Biblical theory would allow that because it causes immoral confusion in innocent and sprouting minds. The most unfortunate thing is that no Christian bishop is speaking against these alleged practices which have happened in the past. Atleast, Bishops, out of moral compulsion, should speak against instances like these. It can significantly remove any uncertainties in the future of a harmonious Kashmiri society. Until now, there has been a deafening silence. It has made them a silent spectator in the times of injustice. They have become an adversary of faith they propagate, and they have also become an adversary of a society they live in. It is sadly true, no matter how much the debate rages on. Let us also not forget the contribution that Christian missionaries have made in Kashmir. Since a century, missionaries have flocked into downtrodden lands, in pursuit of a rightful change for the laden and the oppressed. At the time of any natural disaster, many Evangelist organisations are one of the first to disburse relief. Let us also not forget, our first martyr, Robert Thorpe, was a Christian, who fought against the tyrannies of Dogra power. Our history is recorded in the diaries of British officers, who back in their times, inked the dementias of cruel political monarchism. People like Sir Walter Lawrence and Alaistar Lamb were Christians, who recorded unbiased and dejecting nostalgias of our mournful history. We should balance the facts and not create a prejudice, out of hate, and out of competing superiorities in faith. That is what every faith in the world propagates. There are also tireless nuns who have worked for the upliftment of women. There are passionate priests who want Kashmiri children to get enlightened and face the world - the community of elite missionary schools in Kashmir who have had a major role to play in shaping the academic character of Kashmiri people, in propagating the rightful ideas of intellectualism and personality building. Having said that, the grassroots of their philosophy and ideals lie in contradiction with the harsh political realities of Kashmir. Their goal is short term, chained by the nationalism of the place they belong from. When I was a student at Burn Hall, I still remember a time when our principal stopped a student to speak about an innocent boy who was taken into custody by the police. There was nothing what I could do apart from going to my class and learn my books. But it made me realise that the long term goal of self-reliance, which Kashmiris have aspired for generations – to construct political, social and economic independence, causes them to be like muted clans, who seem to be imprisoned by the mission they follow. They see the scruples of justice from the prisms of their respective commissions. Unfortunately, only qualms of bias have emerged out of these temples of knowledge. It made me realise that there is no one who can narrate the disasters of Kashmir than a Kashmiri himself. Kashmiris, indeed, ought to tell their history themselves.